Our new fall 2018 workwear collection is a celebration of the modern working woman. This collection offers relaxed, new pieces that will effortlessly go through all the big (and small) moments of your life. From cool tweed blazers to check print trousers, going from work to life has never looked so good. Here are 6 office-appropriate looks that will take you from work to life, and anywhere in between. From desk to dinner to Sunday at the market, this bouclé blazer is a wardrobe essential for effortless day-to-day styling. The feminine pearl button details and oversized fit make this blazer perfect to pair with both trousers and jeans. Shop the look. Add a touch of softness to your closet with pastel tones. 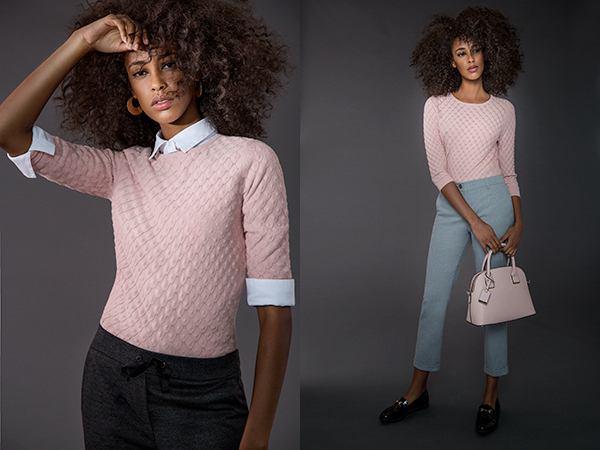 Pair this textured blush sweater with a white button-down and some cropped trousers for a pretty-in-pink-meets-girl-boss vibe. Complete the look with a structured satchel and loafers. Shop the look. Inject the pattern of the season into your busy lifestyle with this check print suit. Take charge of that meeting (or that 5 hour flight) in this tailored silhouette. Whether worn as a matching set or separately, your work-to-life staples have never been so versatile – or looked so chic. Shop the look. For those multiple-coffee-run mornings, turn to this easy-to-wear, easy-to-style jumpsuit. Pair with a crisp button-down and some #bossbabe hoops for a relaxed and chic ensemble. Get ready to power through the day – all in one piece. Shop the look. 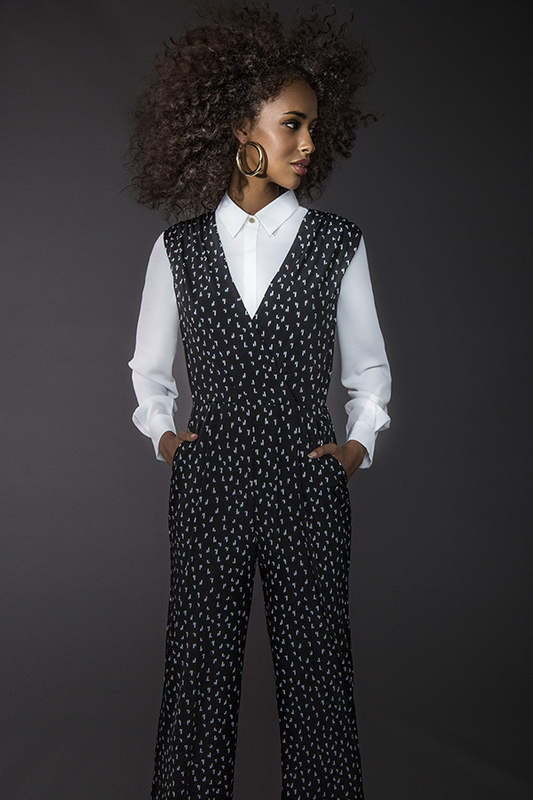 Update your no-fuss workwear with these high-waisted, belted trousers in a sleek glen-check print. Whether for the boardroom or the bar, add some pattern play to your look with an abstract-printed blouse. Shop the look. Be polished yet comfortable all day in this season’s modern twist on the wrap dress. Rethink your layers by pairing this classic dress silhouette over a long sleeve blouse for a slight touch of whimsy. Shop the look. Watch the Work to Life Campaign video here.